eGrips Prevents Gravitational Devastation | OhGizmo! By David Ponce on 02/09/06 • Leave a comment! They say that it’s not the falling off a table’s edge that kills your precious gadget. It’s the hitting the floor hard that does it. 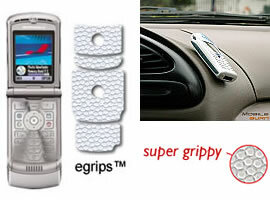 Lame joke aside, these little “appliqu?s” called eGrips look like a rather low cost way of keeping your electronics with the wires on the inside. There are made out of a grippy material that sticks to the backside of your gadget and increases its chances of not sliding off of whatever. They make these appliqu?s for hundreds of different models of gadgets, and they don’t seem to cost much more than $10 to $15. The grip is supposed to last for about 6 months if properly taken care of.